How does one get accepted into a good college (besides the obvious stuff like getting As)? I am 25 years old with an associates of science degree. I currently have a full time job with benefits, the pays not bad (17.50/hr) but with more education, I can do better. One benefit that my employer offers is tuition assistance, up to 8,000 dollars a year. This would cover me for about 4 courses a year. I just recently paid off the last of my student loans and have no debt at the moment. Would it be better to stay in my current job, go to school for free part time, accumulating 12 to 15 credits a year to earn BS in about 4 to 5 years or leave my full time job, take out loan and go to school full time and hopefully earn a BS within the next 2 years while also working part time in the event industry (600-1050/month)? Talk to people about your decision process until you get sick of it and then go with your gut. There is a popular argument that paying Politicians more would mean the smartest people (who otherwise go into high paid jobs in the city) would be more likely to take jobs in politics. Therefore the country would be run by smarter people. However my idea would be to turn this upside down - pay politicians next to nothing in comparison, enough to live on maybe £20,000 p/a. This has economic sense. People get a derived utility from their pay, but also from how 'enjoyable' their job is to them. If we pay politicions very little, the job will only attract the people who get the most utility from working in that field; those who enjoy it most, and want to do the best for the Country. Therefore we get rid of all the dodgy politicians who are only in it for the bumper pay cheque. Does an existing consumer relationships trump the better deal from an unknown? Is our spending influenced more by comfort or the deal? Are we more inclined to shop with someone we know (e.g. Family, Friends)? What is the tipping point of leaving our shopping comfort zone. Did you mess up the ten commandments in the book or is your reading of the ten from a Jewish perspective rather than a Christian one? I'm not trying to start a flame war, but rather asking a sincere question. Your first commandment was the preamble, or so I thought, and you seemed to skip over "Thou shalt not make unto thee any graven image". I would appreciate your comments on this. In your books you say that you prefer the small questions. Or, if you cant answer the big question, try a smaller one.vthis has gotten me thinking, is this a reasonable reaction? Will answers to a lot of small question give an image of the bigger picture. A consept of which I want to refer is emerging properties. The individual parts does not explain the whole picture. In Thing like like a freak, you say you try to convince David Cameron that free helth care is a bad idea. It is to expencive. In itself it might be. Still the question is, what expence does healt care have as an integral part of british society? Thinking like a freak is by al means not a bad idea. Whats the point of staying in the fast lane if the is a trafic jam. Try something new. But your answer that if you can not answer a big question, go for a smaller one, does not seem right with me. And when I think about it, it seems like an easy way trap one self in a conclution not necesarily within reason. 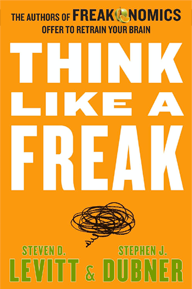 While vacationing on the white sands of Punta Cana, I decided to read, "Think Like a Freak". I really enjoyed every bit of this book. When I returned back to Cincinnati, I was reading through some of the news I missed and noticed John Kasich has joined the craziness we call the presidentail race. One of the first articles I read today was titled, "John Kasich's 'I don't know' answer." I thought this article was pretty interesting considering one of the ways to think like a freak is having the ability to say, I don't know. I guess not all politicians have answers to everything like we thought. Article from my comment above. Beginning on page 66 of "Think Like a Freak", the term "root cause" and "the root cause" are used. What do these terms mean? How does one distinguish between a "root cause" and some other harmful condition, behavior, action, or inaction?